Orbital cellulitis is an infection of the orbital soft tissues posterior to the orbital septum. It has the potential to be affect sight and function of the eye and extraocular tissues. Although it is commonly seen in the pediatric age group, adult orbital cellulitis is not uncommon. Infection usually originates from sinuses but sometimes the nidus of infection is in the eyelids, from retained vegetative foreign bodies, or very rarely from distant infection spreading to the orbit spread from blood. It is characterized by pain, proptosis, chemosis, diminution of vision, fever, periorbital erythema, and limitation of ocular motility. Historically orbital cellulitis was a sight and life-threatening condition. However, with the advent of high quality imaging, antibiotics and early surgical intervention to drain the orbital abscess when indicated, the chances of visual loss have reduced significantly. The purpose of this review is to describe current investigative and management paradigms in the treatment of orbital cellulitis and current recommendation in the management of complications resulting from it. Orbital cellulitis is not an uncommon infection involving ocular adnexal tissues posterior to the orbital septum. The orbital septum acts to separate the less severe preseptal cellulitis from the potentially more dangerous orbital cellulitis. Most commonly the etiology is bacterial, although infrequently it may be fungal and rarely even viral. Orbital cellulitis is most commonly seen in the pediatric adolescent age groups and young adults. The most common source of infection is the paranasal sinuses – the ethmoids followed by the maxillary and frontal sinuses. Patients may either progress from a preseptal cellulitis or more commonly develop orbital cellulitis from one of the various sources. Bacteria may infect the preseptal and orbital tissues through one of three ways. Infection can also spread through hematogenous routes from a distant source of infection such as otitis media or pneumonia. Preseptal cellulitis is inflammation anterior to the orbital septum commonly seen in the pediatric age group. Uncontrolled, it may spread postseptally and develop into an orbital cellulitis. As all involvement is anterior to the septum, by definition, the globe is not involved. At presentation, there is severe swelling and possibly pain of the affected eyelids. On examination, visual acuity, pupillary reaction, and ocular motility are all normal [Figure 1]. There is no proptosis and the globe is easily retropulsed into the orbit. 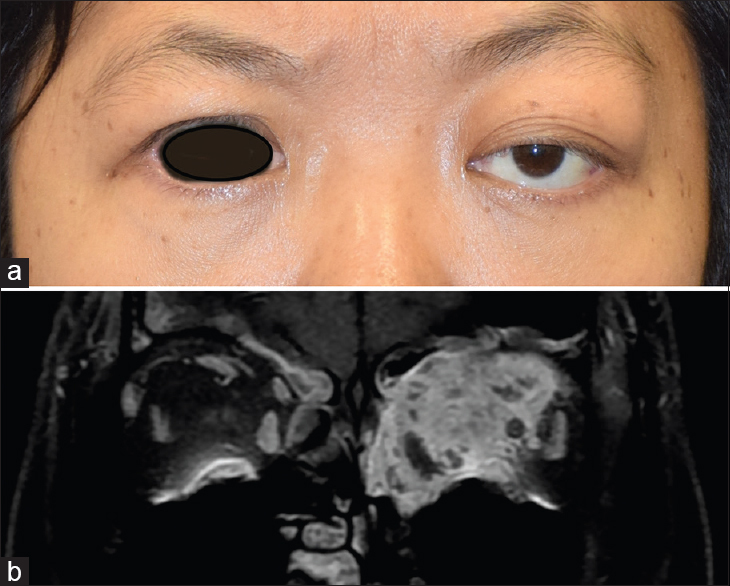 In cases where the severe eyelid edema precludes a proper globe examination, imaging in the form of ultrasonography, computed tomography (CT), or magnetic resonance imaging (MRI) of the orbits may be necessary to exclude orbital cellulitis. When the diagnosis of preseptal cellulitis has been established, prompt treatment should be initiated without delay. In older children and adults, outpatient treatment with oral antibiotics is appropriate for a minimum of 10 days. However, younger children and those at high risk for progression, for example, debilitated patients may warrant admission with parenteral antibiotic administration. Whenever an obvious source of preseptal cellulitis cannot be identified, an underlying paranasal sinusitis or other causes should be ruled out by orbital imaging. In such cases, nasal decongestants should be prescribed unless another source of infection is identified. By definition, it is a purulent infection of the structures posterior to the orbital septum, most commonly, a spread from the adjacent paranasal sinusitis. Untreated or uncontrolled orbital cellulitis can be potentially vision and even life-threatening. Thus, an early and accurate diagnosis coupled with expedited management is of paramount importance to prevent significant morbidity. Eliciting a proper history and a dedicated examination which suggest a possible source of the infection usually guides the appropriate line of management. 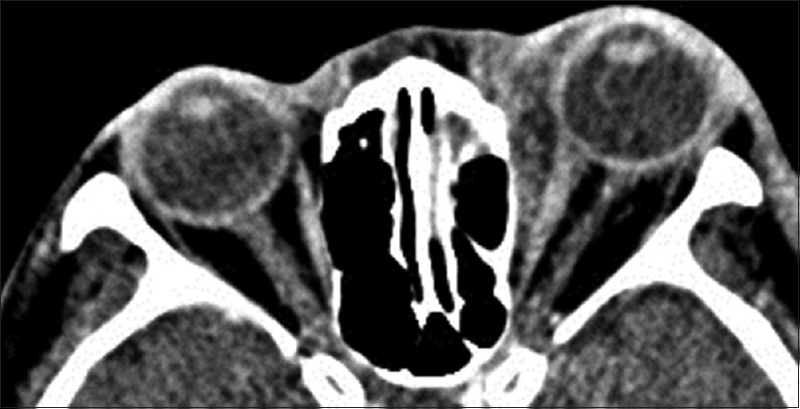 Although the diagnosis of orbital cellulitis is a clinical one [Figure 2], sino-orbital imaging, usually by CT scan is often required to identify underlying sinusitis or when suspected confirm the presence and location of a subperiosteal abscess (SPA), rule out unsuspected foreign bodies or rarely even masquerade syndromes. 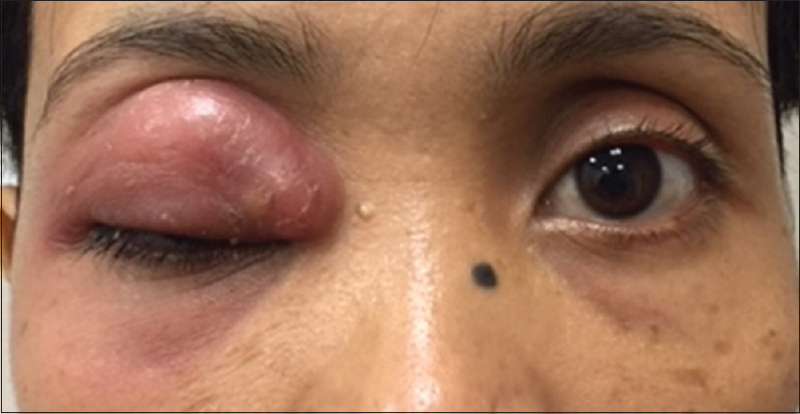 In adults, orbital cellulitis is most often caused by mixed infections – Gram-positive cocci, Gram-negative organisms, and occasionally anaerobes. In young children, a single organism is usually responsible. Commonly implicated pathogens include Streptococcus pneumoniae, S. aureus, and Staphylococcus pyogenes. Haemophilus influenzae was an important pathogen in children in the prevaccination era but seen much less often now. Despite the likelihood of a monoinfection in children, broad-spectrum antibiotics are still warranted as a mixed infection cannot be ruled out. Antibiotics are continued until when and if culture and sensitivity reports are available. More often empirical treatment with these antibiotics can resolve the acute infection by themselves. 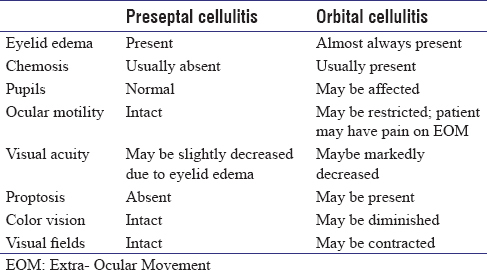 An overview of major differences between preseptal cellulitis and orbital cellulitis are shown in [Table 1]. 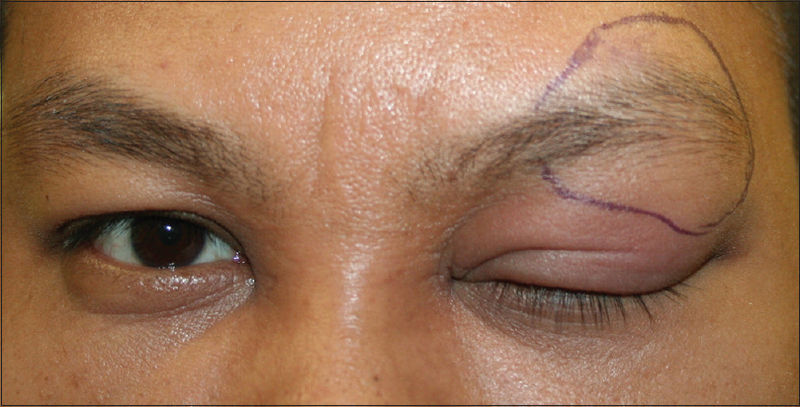 Orbital cellulitis commonly presents with eyelid edema, erythema, pain with or without tenderness, chemosis, proptosis, and limitation of ocular motility. Often the presence of the above clinical signs and symptoms combined with a history of upper respiratory infection may be sufficient to make a diagnosis in most patients. Occasionally, the initial signs can sometimes be very subtle with no external signs of inflammation until the infection has progressed to a severe stage. This is especially a feature of fungal or opportunistic infections of the sinuses with comorbidities such as diabetes mellitus, immunosuppression, and HIV infections. Corneal ulceration can occur as a result of severe, progressive, and prolonged proptosis along with a secondary glaucoma and can be a major feature of the presentation  [Figure 4]. In severe cases, the inflammation can progress to necrosis and abscess formation affecting the optic nerve, sclera, choroid, and retina. Mechanisms of visual loss from optic nerve involvement include an optic perineuritis or neuritis, direct mechanical compression from abscess formation [Figure 5], or vascular occlusion of the vessels supplying the optic nerve. The localized orbital inflammation may progress to orbital abscess. Intraocular infections and inflammations may progression from frank endophthalmitis to panophthalmitis and may also present as orbital cellulitis. In some cases, there might be orbital cellulitis with no ocular involvement but extensive extraocular soft-tissue infection and inflammation. Ultrasound orbital imaging is one of the first and easiest imaging modality available to the clinician. Although it can be performed in the office setting, the features are often nondiagnostic, visualization is semi-quantitative and often technician dependent. The utility of X-rays in the current scenario is limited to detecting sinus pathology and is also not very useful in the diagnosis of orbital cellulitis. MRI may be necessary in some cases where CT scan may not be sufficient to provide the full picture. 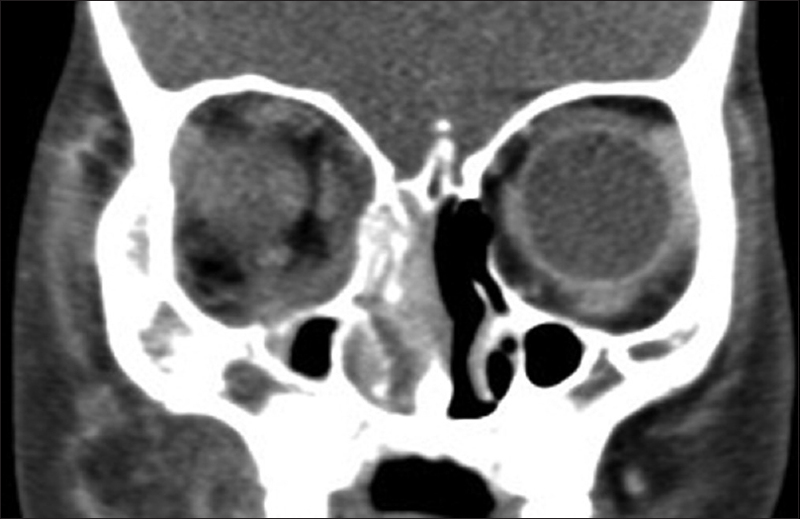 Although the role of MRI in orbital cellulitis is not well established, it has some utility in patients suspected of involvement of the optic nerve, orbital apex, and intracranial extension such as those involving the cavernous sinus. In some cases where there is a strong suspicion of abscess formation despite a negative CT, an MRI may confirm the suspicion and thus provide great benefit in management [Figure 7]. This phenomenon was reported in a 14-year-old child by Sepahdari et al. However, the longer acquisition time required for an MRI proves to be challenging, especially in younger children and infants where prolonged sedation or general anesthesia may be required for the investigation. In summary, a CT scan is the first line of investigation despite the risk of radiation and provide the necessary information for further management. and rule out other conditions that may present as proptosis with or without ophthalmoplegia. However, it should be remembered that treatment should not be delayed while awaiting investigation and the first dose of intravenous antibiotics should be administered first. Cultures are usually noncontributory to the medical management of orbital cellulitis unless there is open festering wound, profuse discharge, or pyrexia. Cultures taken directly from abscess are more likely to yield a positive result than those taken from the blood. The swab samples collected from the conjunctiva may have no correlation to the causative organism. The microorganisms usually seen in acute sinusitis are often the culprits. S. aureus, Streptococcus, Haemophilus influenzae, and some anaerobic strains such as Bacteroides, Peptostreptococcus, and Fusobacterium are the most commonly isolated organisms in patients from the pus culture.,, Methicillin-resistant Staphylococcus aureus(MRSA) is slowly becoming a common cause of head and neck infections which may extend to the orbit. S. aureus is a causative agent in about 30% of patients, and among them, incidence of MRSA varies from 23% to 72%. Fungal infections of the orbit are usually caused by opportunistic pathogens and often present with mixed infection alongside the fungal infection. They may arise endogenously but more commonly from posttraumatic vegetative foreign bodies or as an extension of fungal sinusitis. These infections may also be seen in settings of immunosuppression – posttransplant patients, uncontrolled diabetes patients, or HIV-infected patients with low CD4 counts where they are often life-threatening [Figure 8]a, [Figure 8]b, [Figure 8]c. The most common fungal orbital infections are caused by Rhizopus, Mucorales, and Aspergillus species in that order. Fungal infections of the orbit can be highly destructive and have high mortality rate among those affected. Rarely isolated fungal infections and granulomas seen in immunocompetent patients – both adults and children [Figure 9]a and [Figure 9]b. Viral infections of the orbit are even more rare and may either be related to systemic viral afflictions or regional infections, for example, recurrent herpetic infections [Figure 10]. A good clinical history and thorough clinical examination are essential to establish a diagnosis of orbital cellulitis. While the diagnosis is principally clinical confirmed by imaging, other differential diagnoses should always be kept in mind. A child with orbital cellulitis is most likely to have an upper respiratory infective episode followed by rapid progression to eyelid swelling, proptosis, chemosis, and possibly pain. These symptoms are also accompanied by pyrexia, raised leukocytosis, raised erythrocyte sedimentation rate general toxic appearance. Other serious and potentially life-threatening conditions to rule out despite their rarity include neoplasms such as rhabdomyosarcoma or even orbital retinoblastoma. Other differentials include specific and nonspecific orbital inflammatory disorders, orbital leukemia, metastatic neuroblastoma, hemorrhagic cysts, orbital myositis, and infected nasal foreign bodies. Rarely, severe forms of adenoviral conjunctivitis with inflammatory edema, chemosis, and injection may also mimic orbital cellulitis and should be managed conservatively , [Table 3]. Treatment of orbital cellulitis is still guided to some extent by Chandler's classification which was published in 1970 [Table 2]. According to these guidelines, Groups 1 and 2 are recommended medical treatment while surgical intervention may become necessary in Group 3 onward. The advent of modern antibiotics and orbital imaging has radically changed the outcomes of management, and thus clinical features may not always follow the sequence mentioned above. Depending on severity, oral or parenteral antibiotics are the mainstay of medical management. Some studies advocate hospital admission, close monitoring, and IV antibiotics as the first line of treatment, especially in children and adults with immunosuppression, while others propose a trial of outpatient oral antibiotics with daily review to titrate treatment  [Table 4]. Antibiotics prescribed are usually based on the common pathogens in the geographic region or institution. An empirical treatment consisting of a third-generation cephalosporin or penicillin-based antibiotics that cover the most common causative organisms mentioned earlier is usually prescribed. A useful clinical pearl is to demarcate the zone of erythema/induration which can be monitored every few hours for rapid progression or improvement [Figure 13]. It should be noted that the first sign of response to antibiotics is stabilization of clinical findings with nonprogression, and thus antibiotics continued without change. The authors frequently prescribe amoxicillin-clavulanic acid to cover Gram-negative and Gram-positive organisms. In patients allergic to penicillin, macrolides or doxycycline with or without intravenous fluoroquinolones (e.g. levofloxacin) may be prescribed depending on the severity. If culture and sensitivity of the pus culture suggest an MRSA, clindamycin, or vancomycin is added. Metronidazole is used to cover for anaerobic organisms in macerated wound or crush injuries, in the presence of contaminated foreign bodies, oral/dental source of infections, or when gas-forming organisms are suspected. If a fungal infection is suspected, the underlying systemic infection or immunologic status should be addressed first. Tissue diagnosis, by microbiological staining, cultures, and in special situations polymerase chain reaction are essential to diagnose and initiate antifungal treatment. Liposomal amphotericin B or voriconazole is used depending on the fungal species, especially if they are invasive. Posaconazole may also be indicated for Aspergillus species, but serum drug levels should be monitored, in addition to parameters for systemic toxicity. However, not all orbital abscesses are amenable to endonasal endoscopic drainage. Superior and lateral abscessed often require direct drainage. When open drainage is required, lid crease incision or a lateral canthotomy incision is used to access the abscess area. Postdrainage, the pus is sent for culture and sensitivity and patient's antibiotic coverage is changed accordingly. Garcia and Harris in 2000 were the first to define working criteria to medically or surgically manage SPA in children [Table 5]. Children under 9 years of age with SPAs from sinusitis were included in the study. Exclusion criteria included abscesses of dental origin, existing optic nerve compromise, and gas-forming organisms. In this study, they reported a 93% response to medical management. This study marked a turning point in the evolution of management of pediatric SPA [Table 3]. However, without applying such strict criteria, other groups including Rahbar et al., reported only 26% patient response to medical therapy without requiring surgical intervention. The decision to intervene surgically varies from country to country. In the US, medical management of orbital cellulitis seems to be the more prevalent trend. In Germany, about 30% of children with Chandler Group I and II orbital cellulitis and 90% of children with Group III and IV were managed surgically. In a study from Singapore, 65% of patients with orbital cellulitis were managed surgically in, usually without an attempt at medical therapy. Threshold and factors influencing surgical intervention include clinical severity at presentation, ocular motility and visual compromise, response to systemic antibiotics over 48–72 h, clinical and radiological findings, availability or an orbital surgeon and rhinologist, and finally fitness and availability of general anesthesia. 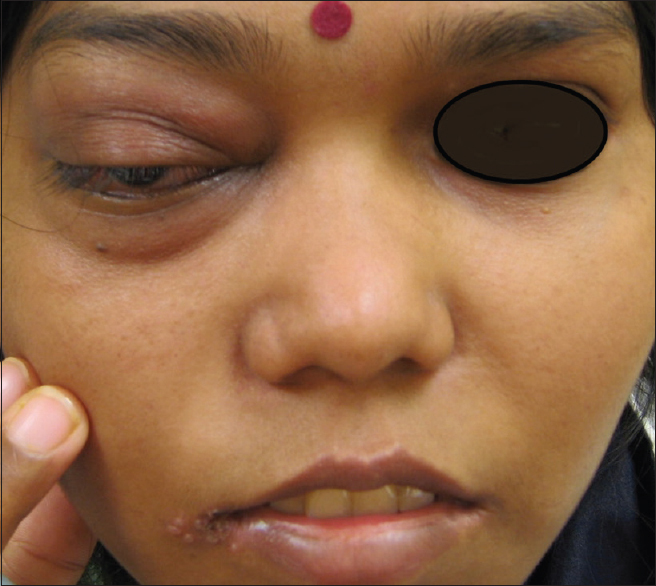 In the rare event of fungal orbital cellulitis which can spread extensively even before the patient has signs and symptoms, aggressive surgical debridement with concomitant antifungal therapy in consultation with an infectious diseases specialist is advocated to get ahead of the pathological process. Due to long-term therapy required in such cases, liposomal amphotericin B may be used in combination with micafungin to mitigate sometimes severe side effects of regular amphotericin B. Hyperbaric oxygen as an adjunctive therapy also has a role in such cases. Newer antifungals, voriconazole, and posaconazole have not only enhanced tissue penetration but certainly enhanced outcomes with reduced systemic toxicity, although they should be monitored. Patients with these fungal infections should, however, be comanaged by the ophthalmologist, rhinologist, and an infectious diseases specialist. In general, close monitoring of the patients general medical status and ophthalmic signs determine improvement or deterioration of orbital cellulitis. Clinical signs on ophthalmic examination should include best-corrected visual acuity, color vision assessment, ocular motility, assessment for a relative afferent pupillary defect, and tenseness of proptosis. The clinician should take the call as to when to intervene surgically based on the above physical parameters. Modern antibiotic therapy has substantially reduced the severity and residual morbidity following orbital cellulitis. Blindness claimed a significant number of eyes affected by orbital cellulitis, with some older case reports publishing rates as high as 20% of cases. Quite significantly, the case reports reporting blindness have reduced drastically that it is almost considered rare. However, in patients in underserved areas both in developing and developed nations or where patients have been managed poorly or referred late visual loss may still be encountered [Figure 14]. Connel et al. in 2001 reported a single case of a 69-year-old male patient presenting with rapidly progressing proptosis and ophthalmoplegia with no light perception of the affected eye despite aggressive antibiotic and immediate surgical intervention, probably from a virulent microbe. Ferguson and McNab reported 18 out of 52 patients (35%) with orbital cellulitis had reduced visual acuity during the course but on late follow-up, only two of them (4%) had permanent vision loss. SPA is more commonly seen in children than in adults. An SPA by itself is not an indication for surgical intervention and various other factors including age, size, and location of the abscess needs to be taken into account before surgical intervention. Garcia and Harris criteria need to be applied more critically than Chandler's classification. Intracranial abscess [Figure 15] is more likely to be caused by extension of a sinus infection than a primary orbital cellulitis. Frontal sinus is the most common culprit, followed by ethmoid and maxillary sinuses. Maniglia et al. reported 19 cases of intracranial abscess where the site of infection was midface and the organisms involved were anaerobic in nature. Hartstein et al. 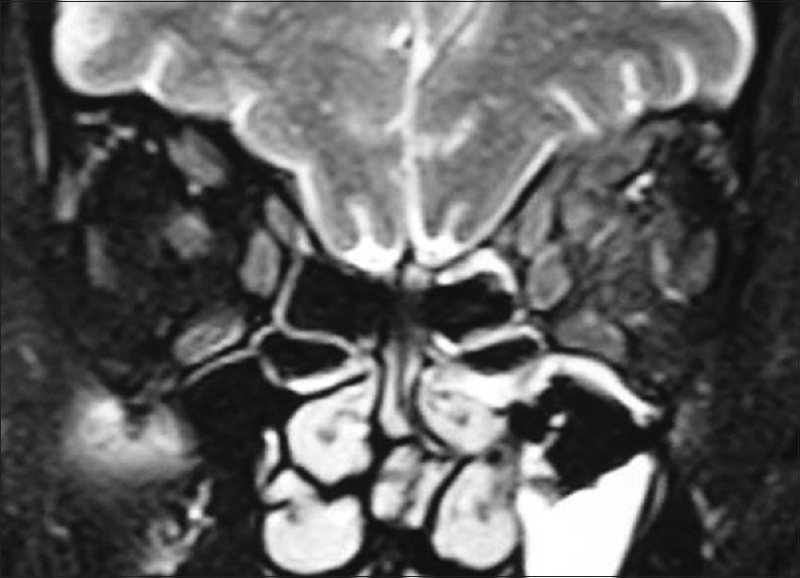 in 2001 published a case series of three patients with pansinusitis with extended into the orbit as a SPA and into the intracranial region causing abscess. Intravenous antibiotics with draining of the abscess and debridement of the sinuses were successful in resolving the condition with two of those requiring intracranial drainage. Cavernous sinus thrombosis and rupture of the abscess inside the cranium can have fatal consequences. Patient with intracranial abscess sometimes be asymptomatic. Alternatively, patients may have nausea, vomiting, seizures, and altered sensorium. Pyrexia and mental instability may portend the prognosis of the infection and may be indicative of the severity of the infection. External signs in an intracranial abscess are mostly seen in adults and very rarely in children highlighting the importance of close monitoring in the pediatric age group. Imaging is indicated on an urgent basis whenever there is even a little suspicion of intracranial extension. Similarly, response to treatment can be gauged through serial magnetic resonance scans. Orbital cellulitis is more common in children and young adults, typically from an acute or acute on chronic sinusitis. Diagnosis is typically clinical based on clinical suspicion but confirmed on imaging of the orbit and paranasal sinuses. CT scan is the imaging of choice, while MRI is used to detect intracranial spread or cavernous sinus thrombosis involvement. Medical management remains the mainstay of treatment in preseptal and orbital cellulitis. While there is no universally accepted protocol for treating subperiosteal abscess, the Garcia and Harris criteria is the most accepted modality in deciding surgical intervention in pediatric SPAs. Infectious diseases specialist consult and comanagement are indicated in patients unresponsive to conventional antibiotics and in fungal orbital infections. Surgical drainage of the abscess is considered when the infection progresses or does not respond to medical management or those threatening vision. The clinician should keep a low threshold for surgical intervention in such cases. Chaudhry IA, Shamsi FA, Elzaridi E, Al-Rashed W, Al-Amri A, Al-Anezi F, et al. Outcome of treated orbital cellulitis in a tertiary eye care center in the middle east. Ophthalmology 2007;114:345-54. Chaudhry IA, Shamsi FA, Elzaridi E, Al-Rashed W, Al-Amri A, Arat YO, et al. Inpatient preseptal cellulitis: Experience from a tertiary eye care centre. Br J Ophthalmol 2008;92:1337-41. Chaudhry IA, Al-Rashed W, Arat YO. The hot orbit: Orbital cellulitis. Middle East Afr J Ophthalmol 2012;19:34-42. Botting AM, McIntosh D, Mahadevan M. Paediatric pre- and post-septal peri-orbital infections are different diseases. A retrospective review of 262 cases. Int J Pediatr Otorhinolaryngol 2008;72:377-83. Brook I. Microbiology and antimicrobial treatment of orbital and intracranial complications of sinusitis in children and their management. Int J Pediatr Otorhinolaryngol 2009;73:1183-6. Chandler JR, Langenbrunner DJ, Stevens ER. The pathogenesis of orbital complications in acute sinusitis. Laryngoscope 1970;80:1414-28. Chaudhry IA, Shamsi FA, Morales J. Orbital cellulitis following implantation of aqueous drainage devices. Eur J Ophthalmol 2007;17:136-40. García A, Aspillaga C, Cruzat-Mandich C, Barja S. Recommendations from parents of obese children in treatment to the health-care team: Qualitative study. Rev Chil Pediatr 2017;88:495-501. Maniglia AJ, Goodwin WJ, Arnold JE, Ganz E. Intracranial abscesses secondary to nasal, sinus, and orbital infections in adults and children. Arch Otolaryngol Head Neck Surg 1989;115:1424-9. Goh PS, Gi MT, Charlton A, Tan C, Gangadhara Sundar JK, Amrith S, et al. Review of orbital imaging. Eur J Radiol 2008;66:387-95. Bedwell J, Bauman NM. Management of pediatric orbital cellulitis and abscess. Curr Opin Otolaryngol Head Neck Surg 2011;19:467-73. Harris GJ. Subperiosteal abscess of the orbit. Age as a factor in the bacteriology and response to treatment. Ophthalmology 1994;101:585-95. Harris GJ. Subperiosteal abscess of the orbit: Computed tomography and the clinical course. Ophthal Plast Reconstr Surg 1996;12:1-8. Hornblass A, Herschorn BJ, Mines J. Preseptal cellulitis in frontalis suspension for congenital ptosis. Plast Reconstr Surg 1984;74:574-5. Sepahdari AR, Aakalu VK, Kapur R, Michals EA, Saran N, French A, et al. 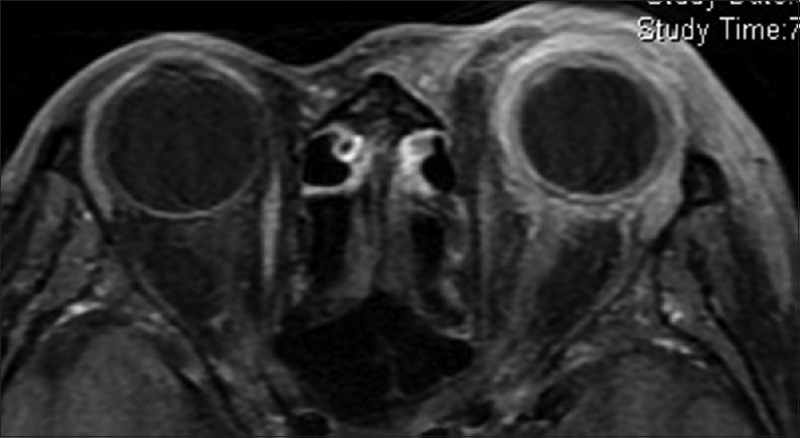 MRI of orbital cellulitis and orbital abscess: The role of diffusion-weighted imaging. AJR Am J Roentgenol 2009;193:W244-50. Hornblass A, Herschorn BJ, Stern K, Grimes C. Orbital abscess. Surv Ophthalmol 1984;29:169-78. Ferguson MP, McNab AA. Current treatment and outcome in orbital cellulitis. Aust N Z J Ophthalmol 1999;27:375-9. Liao S, Durand ML, Cunningham MJ. Sinogenic orbital and subperiosteal abscesses: Microbiology and methicillin-resistant Staphylococcus aureus incidence. Otolaryngol Head Neck Surg 2010;143:392-6. Rahbar R, Robson CD, Petersen RA, DiCanzio J, Rosbe KW, McGill TJ, et al. 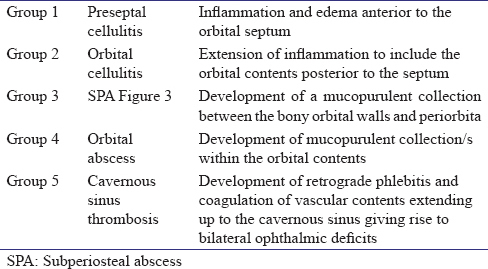 Management of orbital subperiosteal abscess in children. Arch Otolaryngol Head Neck Surg 2001;127:281-6. Sciarretta V, Demattè M, Farneti P, Fornaciari M, Corsini I, Piccin O, et al. Management of orbital cellulitis and subperiosteal orbital abscess in pediatric patients: A ten-year review. Int J Pediatr Otorhinolaryngol 2017;96:72-6. Manning SC. Endoscopic management of medial subperiosteal orbital abscess. Arch Otolaryngol Head Neck Surg 1993;119:789-91. Garcia GH, Harris GJ. Criteria for nonsurgical management of subperiosteal abscess of the orbit: Analysis of outcomes 1988-1998. Ophthalmology 2000;107:1454-6. Siedek V, Kremer A, Betz CS, Tschiesner U, Berghaus A, Leunig A, et al. 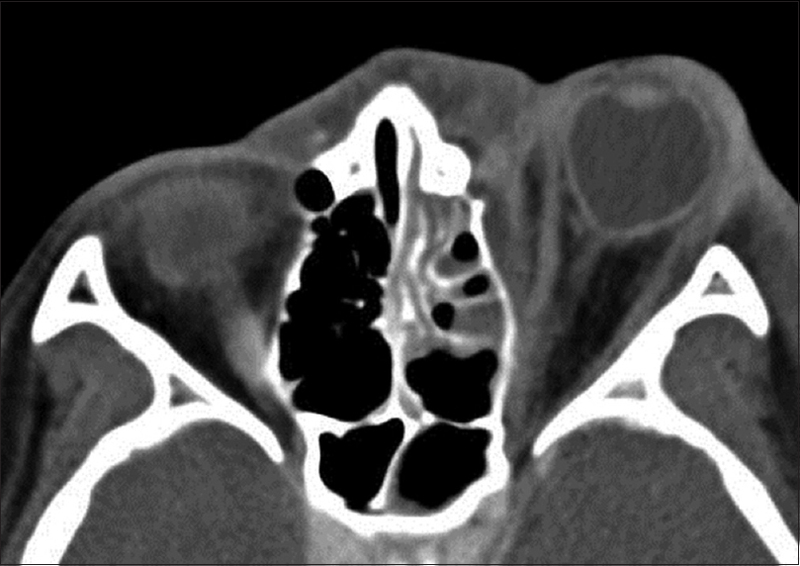 Management of orbital complications due to rhinosinusitis. Eur Arch Otorhinolaryngol 2010;267:1881-6. Yang M, Quah BL, Seah LL, Looi A. Orbital cellulitis in children-medical treatment versus surgical management. Orbit 2009;28:124-36. Farooq AV, Patel RM, Lin AY, Setabutr P, Sartori J, Aakalu VK, et al. Fungal orbital cellulitis: Presenting features, management and outcomes at a referral center. Orbit 2015;34:152-9. Connell B, Kamal Z, McNab AA. 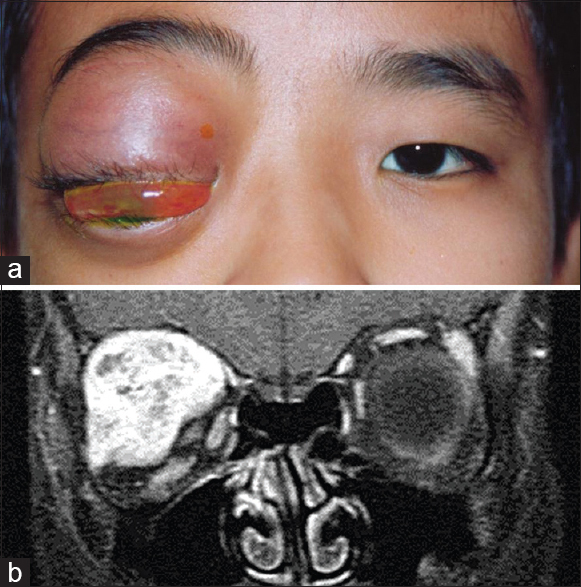 Fulminant orbital cellulitis with complete loss of vision. Clin Exp Ophthalmol 2001;29:260-1. Hartstein ME, Steinvurzel MD, Cohen CP. Intracranial abscess as a complication of subperiosteal abscess of the orbit. Ophthal Plast Reconstr Surg 2001;17:398-403. Giannoni C, Sulek M, Friedman EM. Intracranial complications of sinusitis: A pediatric series. Am J Rhinol 1998;12:173-8.